As you know, I am a bit of a fan of google labs and the research solutions it provides. I lately played with the Google Ngram Viewer. This tool looks for words and combination of words in book corpus, and plot the number of occurrences of the looked for words (in respect to the total size of the corpus) with the year. It is a great tool for literary study to find when a word got into the current vocabulary, or disappeared… I decided to check how the idea of European Union made its way into books for the past hundred years. First, I focused my interest on the term “European Union” (and the proper translations for other languages), in French, English, Spanish and German (the four european languages available). The results follow. Note that the y-axis scale are not necessary the same, but have been normalized to te same maximum. Proportion of the term “European Union” in book corpus of given languages. One will notice that the distribution in the English Corpus (I choose the general English and not specifically British or American) looks very different from the others. Also, France gets an early start in the 1950’s and in general, the term picks up in the early 1990’s. 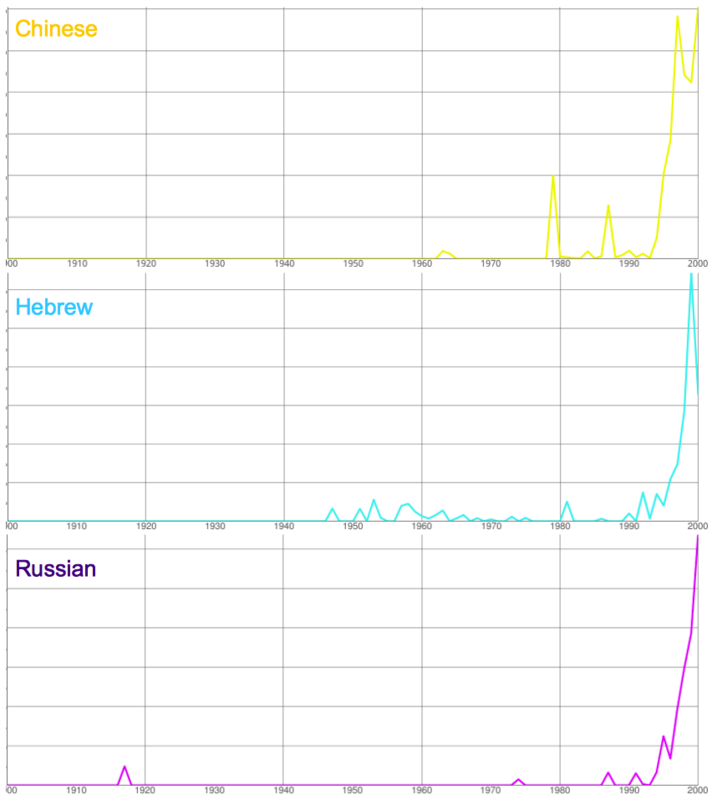 As a comparison, I also looked at the equivalent in the three other available languages: Hebrew, Russian and Chinese. 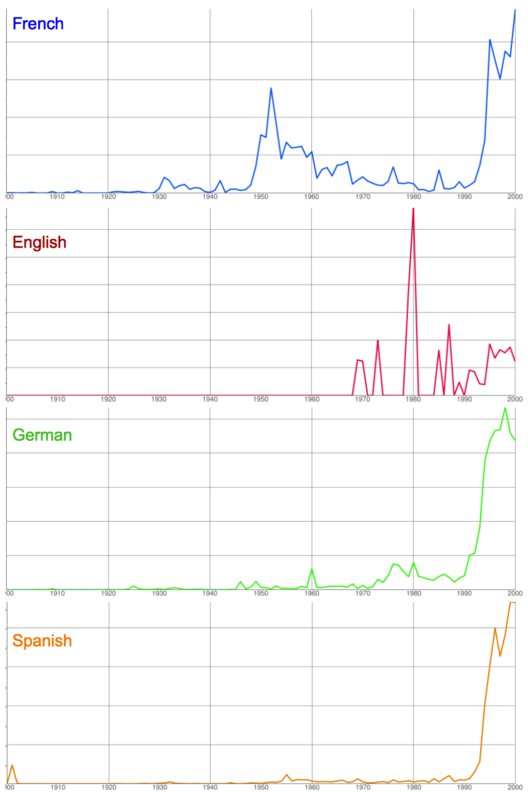 Term distribution for the non-original languages: Chinese, Russian, Hebrew. In these distribution, the term picks up in the mid-1990’s. One can see a general trend in all languages. Except in English, which is probably an issue related to the content of the corpus and not to the mention of European Union. Of course, the appearance of the European Union term in books in the 1990’s is not a surprise, since, before that, the EU was actually the European Economic Community, and before that the European Coal and Steel Community. So I checked for that by looking at the acronyms of the institutions across last century. Acronyms for the EU, EEC and ECSC in the French corpus. We see in the english corpus that the line for the ECSC is not visible… Which is not a surprise, since the UK were not part of the Coal and Steel Community. This quick research shows some potential into the Ngram analysis of books to observe the evolution of ideas on Europe with time during the early years of the European Union. Altho the content of the research corpus can introduce some bias into the results.